See scan - perfect condition. This is a nice and rare Soviet USSR Russian badge decoration awarded in 1953 for sharp shooting / perfect shoot and marksmanship. Badge has multi layer enamel work and center is silver showing a kneeled soldier shooting. Reverse is engraved and named to the winner - V. KASONOV. Back knob is also marked by the manufacturer - the Enamel Factory. Front is dated 1953. 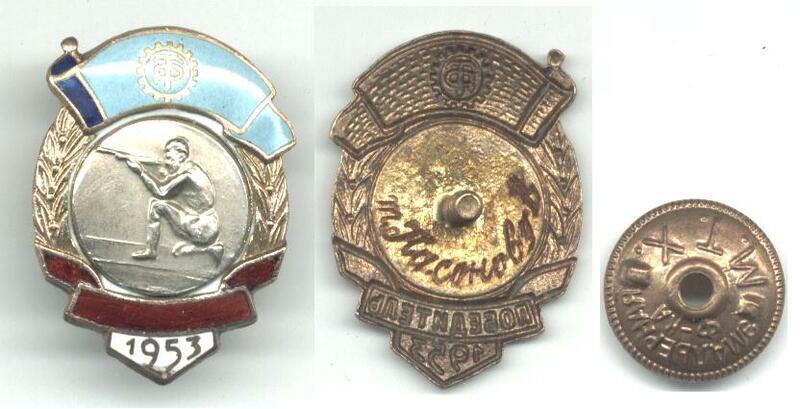 Nice and scarce militaria / military sniper collector piece and one of the rare Russian badges.